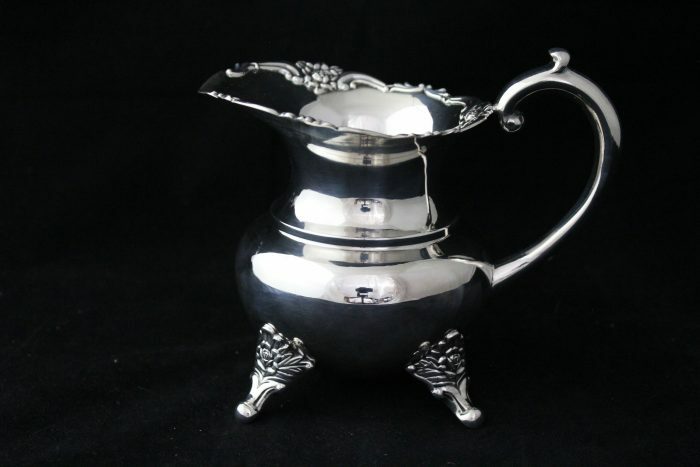 This is a 950 Silver four-piece coffee/tea set that consists of: a coffee pot, 9.5″T x 11.5″L x 5.5″W; a teapot, 7.75″T x 11″L x 5.5″W; a covered sugar bowl, 5″T x 7.25″L x 4″W; a creamer, 5″T x 5.5″L x 3.75″W; and a pair of ice cube picks, 4.5″L x 2.25″W. The set has “C” scroll handles, a rose design, and is raised on four rose feet. The items have no dents or dings.